The brand new Burberry is here! Riccardo Tisci's first collection for Burberry hit the runway in London last night, as the fashion designer debuted 134 looks as the new chief creative officer at the iconic brand. Tisci is renowned for his gothic, dark romance; whilst Burberry is recognised for its quintessentially British style, with its 162-year heritage. The partnership certainly makes an unlikely pair, yet Riccardo Tisci's debut Burberry collection at London Fashion Week for SS19 has been the most highly anticipated show of the season –and it didn’t disappoint. Burberry's Spring/Summer 2019 show at LFW was entitled ‘Kingdom’, and was a collection to bring all generations together. Portraying a mix of British lifestyle, it was divided into three sections –Refined, Relaxed and Evening. The front rows were empty of big names, with many calling it a ‘celebrity free-zone,’ but there were some notable appearances on the runway. Kendall Jenner –who has had a fashion week hiatus, made a special appearance to celebrate Tisci's Burberry debut. After her long absence from fashion week shows, the world’s highest paid model returned to the runway modelling a classic beige Burberry trench (with a gold embellished trim), and her hair slicked back for the show finale. Jenner was joined by a star-studded line-up of models including Stella Tennant, Jourdan Dunn and Lily Donaldson. 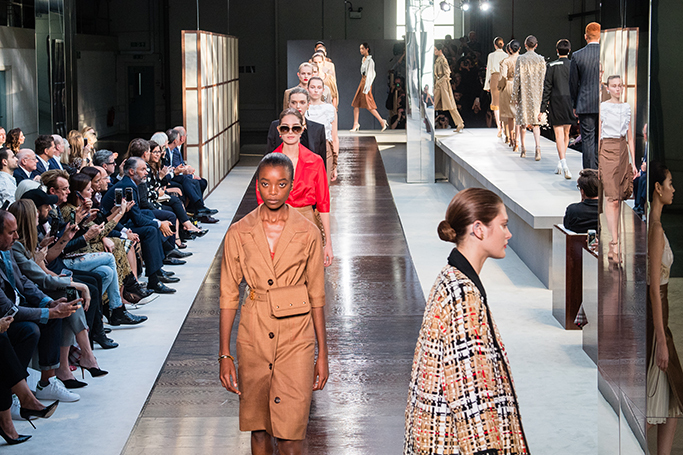 Fifty shades of beige sounds dull, but Tisci took Burberry’s muted palette and elevated it. A brigade of beige walked the opening ‘Refined’ section of the show, which displayed chic modern daywear. Even the Burberry trench coat was given a fresh trim, whilst still maintaining its classic design of sophistication. Through subtle injections of the new logo, sportswear stripes and Doc Martens-style shoes, we were given a glimpse into the future –and it wasn’t boring old beige! Tisci’s debut covered a huge number of different looks (134 to be precise) –that included something for everyone. Transitioning from mother to daughter, the ‘Relaxed’ section comprised of lace slip dresses, printed tees and animal prints upon animal prints. Then there were the punk elements, pieces inspired by Victorian style, plenty of plaid, zip-up leather miniskirts and corsets layered over shirts, as Tisci took us on a journey through British fashion history. We loved it, how could we not –it was designed for everyone, with holes cut in the elitist Burberry image just like this season’s slogan tees. Tisci included a range of menswear –from tailored to streetwear, we saw it all. Taking us back to the brand’s military origins were the men’s suits worn with umbrellas fastened like amour. The designer proved that he can do sophistication, but he’s not travelling too far from his edgier, contemporary roots. Leaving the suave to the refined section, Tisci introduced Bambi-lined parkas, bum bags and ponchos that we already see at festivals in years to come. The key to our heart comes in the shape of a bag, necklace or pair of shades, as we can’t wait to talk about Burberry’s latest accessories. There was series of new stylish handbags, including belt-bags we could see ourselves pulling off. Boldly brilliant sunglasses, umbrellas and pumps with taped-up points. Models also had British passports hung from their necks –and we’re pretty sure there details we didn’t have time to spot. In summary, welcome to the new chapter of Burberry –the Riccardo Tisci era has begun.